Jimbaran - Udayana University held Welcoming New Year 2018, Tuesday (2/1/2018) at Auditorium Building of Widya Sabha Campus Bukit Jimbaran. 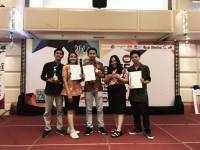 The activities coupled with some activities which started with Launching System "Inventory Management Room (SIPIRANG), Tax Reporting System (SIPAPA) and Information System of General Plan of Package of Udayana University (SIRUPKU)", and Delivered the Jacket to Securities of Unud. Other events were enlivened by Udayana University's Marching Band, Music and Lawak Entertainment, Choir of Unud's Dharma Wanita, and Fashion Show performed by Jegeg Bagus Udayana. 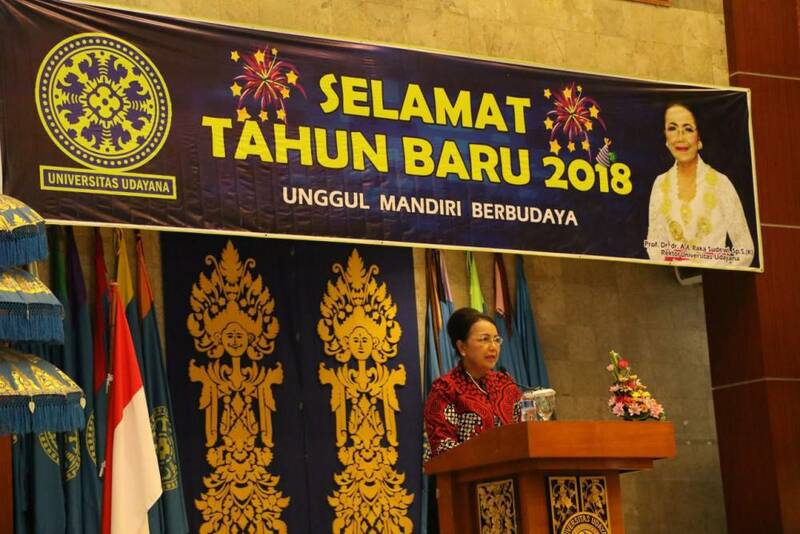 Rector of Unud, Prof. Dr. dr. A A. Raka Sudewi, Sp.S (K) in her speech conveyed during the year 2017 Udayana University successfully perform various achievements including Accreditation A, Independent Research Ranking, Ranking Community Service is very good, Rank PT that Unud is in 17 position by Kemristek Dikti version, Rank Unud based on Webometric 9, Rank QS Star 3 stars, Rank Unud in the world is in 1959 position and Journal Ranking indexed DOAJ. Furthermore, Rector conveyed the research hilirisation need to be enhanced to see the culture of research in the University has grown conducive. The results of research and community service that is nationally disseminated in Senastek IV that participants were very enthusiastic. Outcome research in 2018 is directed to the creation of innovative products and prototypes. In the field of HR, Asset and Finance has been implemented several activities such as training on human resource capacity building, asset management of Udayana University, and the arrangement of campus environment. In the field of student affairs various achievements have been achieved by students in POMNAS and in the future Rector expects to be improved again both in the field of scientific work of students to excel in PIMNAS, as well as in other areas of achievement. 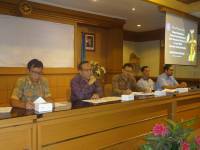 In the field of cooperation, Unud has conducted various cooperation both at home and abroad. Up to 2017 there are 225 domestic cooperation executed either at the central / ministry level, local government, universities, business entities and the private sector. As for foreign cooperation, there are 188 cooperation conducted with various institutions overseas in Asia, America and Europe. Rector hopes that governance in the field of cooperation needs to be improved by improving the monitoring and evaluation function of various cooperation.